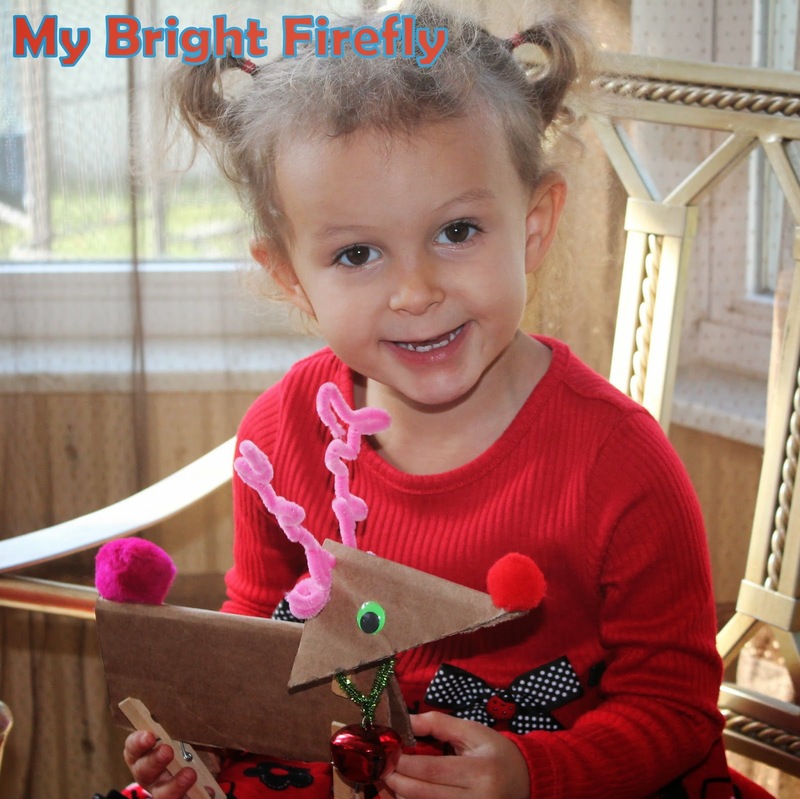 My Bright Firefly: R is for Reindeer. Shapes. 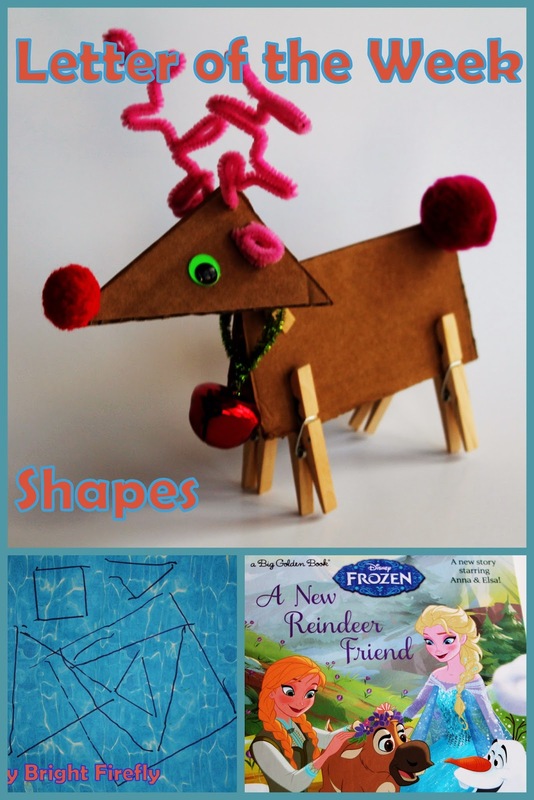 For our letter of the week, we explored triangles and squares hands-on and made a handsome reindeer from given shapes. We've read a beautiful Disney Frozen book and talked about reindeer's life and habitat. This post is part of our "Creative ABCs" series. You can find our previous letter of the week activity here: B is for Birds. Beans and Play Dough Birds. 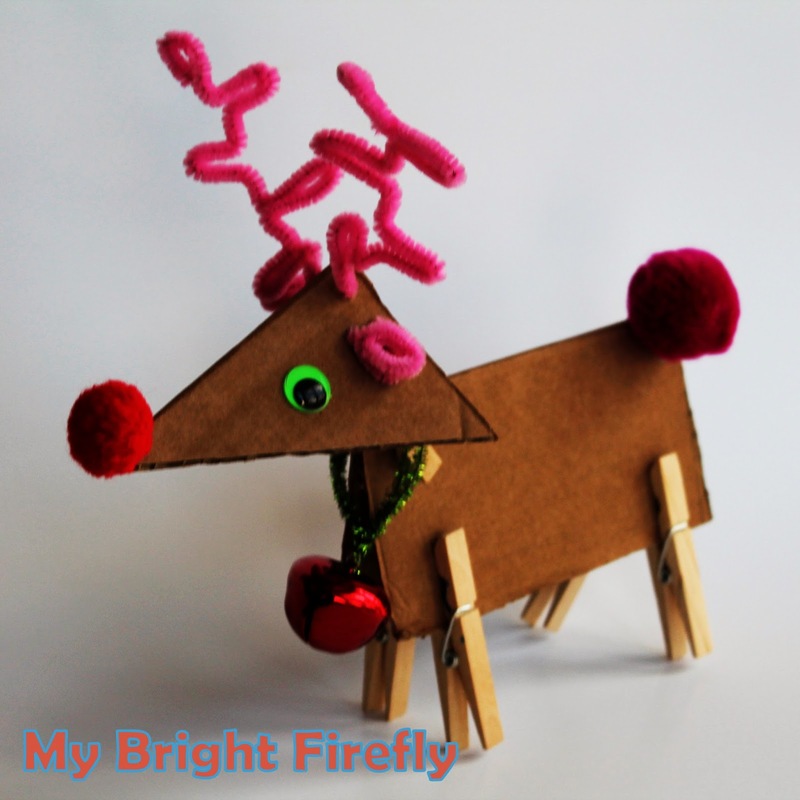 The kids loved their newly made reindeer: how he nods his head, the fun antlers and a soft tail, and dancing with the merry jingling animal. The song we used for our reindeer free dancing: Rudolph The Red Nosed Reindeer. At this age, our kids know their shapes. We are working on how to recognize a shape in a particular object, to build an object with shapes, and learning the characteristics of shapes. Kids had a triangle and a square cut from a cardboard box. They made "floating shapes" by outlining on the preprinted paper with a marker. While doing it, we counted the number of sides for each shape. 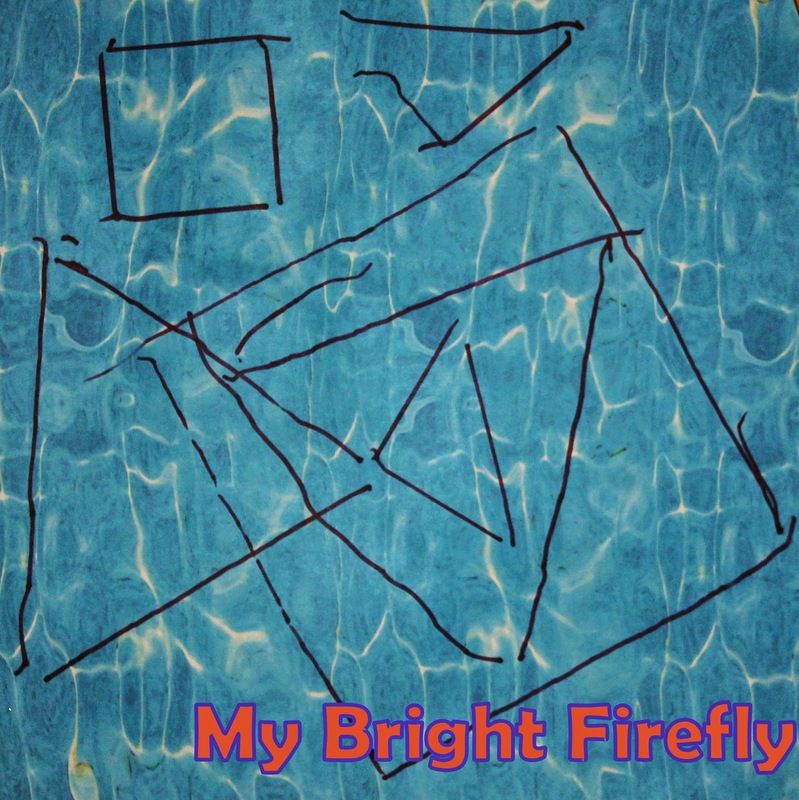 Observation: the big triangle and the little triangle have the same number of sides - 3! The big square and the little square have the same number of sides - 4! Yay for our little discoveries! I folded the above triangle and square in two. Body: 4 cloth pins for legs, a pom-pom for a tail. 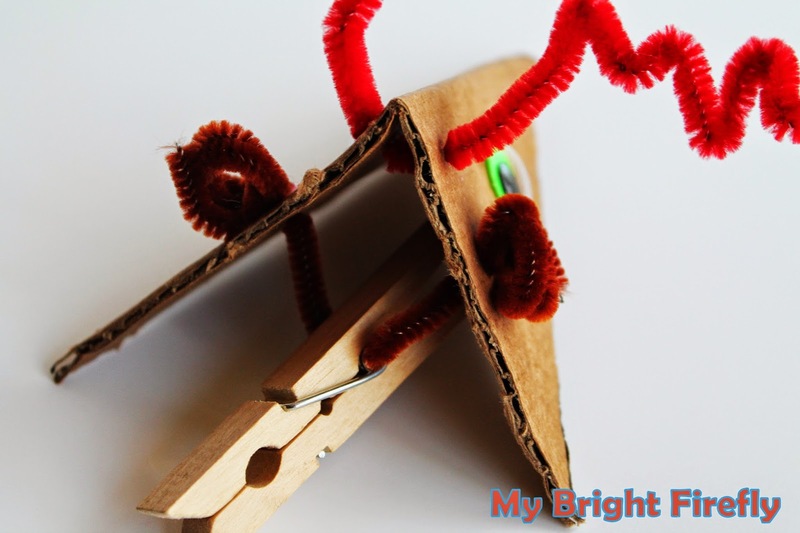 We used the regular white glue which requires some patience: apply a generous amount of glue to a pom-pom, attach it to the cardboard with very little pressure, and leave to dry for at least 5 min. Pictured below: the back of the head. 4 holes are premade with a needle for antlers and for ears. Antlers: thread 1-2 chenille stems and bend the ends to form antlers. Ears and a neck: thread a chenille stem through the holes and the center of a cloth pin, form the ends to make ears by wrapping around your finger. To assemble the reindeer, put your jingle bell around the neck (optional) and pin the neck to the body. Attach the eyes, glue on the pom-pom for a nose, draw a mouth.